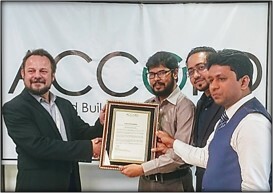 We are extremely glad to announce that, the Accord on Fire and Building Safety (Accord) has recognized SQ Celsius Limited for successfully completing all remediation measures required from the Accord initial inspections for fire, electrical, and structural safety. Accord engineers have physically verified that all items of the corrective action plan, developed from the Accord initial inspections and approved by the Accord Chief Safety Inspector, have been correctly repaired. The recognition ceremony was held on 25th July 2018 at The Accord Country Office. Mr. Mukit Ahmed (Chief Financial Officer), Mr. Rubaet Bin Aziz (Head of Factory HR, Celsius Unit 1) and Mr. Mahfuz Azam Iqbal (Manager, Compliance) were present from SQ Group. We are extremely proud of this significant success and our heartiest congratulations to the team!